Shorter practices and rest are becoming part of Bowling Green’s preparation each week. The Falcons have cut their daily practice times from approximately an hour and 15 minutes to about 50-60 minutes. The players also were given Monday off after the team returned from its trip to Michigan Tech last weekend. The team returned to BG Sunday morning after an approximately 10-hour bus trip home. Falcon coach Chris Bergeron said the team likely will take Monday off after BG visits Bemidji State Jan. 31-Feb. 1 and Alaska-Anchorage Feb. 27-28. “We’re trying to focus on rest and make rest part of our preparation with some of these trips we’ve had,” Bergeron said. The Falcons don’t have an off weekend during the second half of the season and will play at least 11 straight weekends — the final 10 weekends of the regular season, and at least one playoff series. During the first half, they traveled to the University of Alaska (Fairbanks), Alabama-Huntsville, Clarkson in upstate New York, and Northern Michigan. BG had one off weekend and a 27-day break at Christmas. “Our practices are shorter, but they’ll still have the same intensity, the same tempo,” Bergeron said. Most teams in college hockey reduce their practice time during the second half of the season. Teams in the Western Collegiate Hockey Association also are striving to make sure they’re rested because of the long travel in the league. The Falcons have no major injuries, only the normal “bumps and bruises” that are expected at this point in the season, Bergeron said. NEXT: The Falcons, ranked sixth nationally, return to action Friday and Saturday when they host Lake Superior. 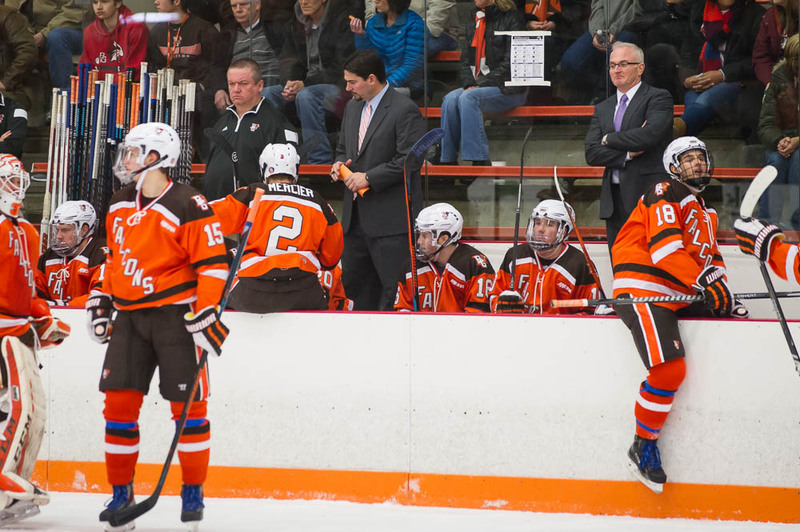 BG is 14-4-4 overall and 10-2-2 in the WCHA. Lake Superior (6-19-1, 5-13) is tied with Alaska-Anchorage for last place in the 10-team league. “We’re not going to pretend like our guys don’t look at the standings, don’t look at records because they do,” Bergeron said. “But our focus, from a day to day to basis, is not going to change, no matter who we play. The Lakers are 3-2-1 in their last six games, including a 1-0, 4-2 home sweep of Bemidji State last weekend. Lake Superior also posted a 2-1 win Dec. 29 and played a scoreless tie against Cornell Dec. 28. STATS: The Lakers are last in the league in scoring (1.69 goals per game) and goals allowed (3.58 gpg). Freshman goalie Gordon Defiel has a 3.29 goals-against average and a .909 save percentage in 24 games. In the last five games, he has a 1.81 goals-against and a .950 save percentage. He stopped 76 of 78 shots in the sweep of Bemidji, which held a 78-44 edge in shots in the series. Defiel leads the nation with 758 saves. Junior forward Bryce Schmitt leads the Lakers with 13 points and shares the team lead in goals (six) with senior forward Stephen Perfetto. The Lakers rank last in the league in power play conversions (8.1 percent, 9 of 111) and penalty-killing (73 percent, 65 of 89). NEW: Laker head coach Damon Whitten is in his first season after serving spending the four previous seasons as an assistant coach at Tech. PLAYOFFS: Because the University of Alaska (Fairbanks) is ineligible for postseason play due to NCAA violations, only one team will miss the WCHA playoffs. Eight teams will qualify for the playoffs. Lake Superior and Alaska-Anchorage are tied for last in the 10-team league with 10 points. The fourth- through ninth-place teams are separated by just six points. POWER PLAY: The Falcon power play was 1 of 5 at Tech last weekend and is only 2 of 23 in the last six games. BG is fourth in the WCHA at 17 percent (15 of 88). HOT STICK: BG freshman forward Brandon Hawkins has a goal in three of the last five games, totaling six goals in that span. His nine goals and 16 assists both are second-best on the team. He’s tied for the team lead in power-play goals with three and tied for fifth in plus-minus with an on-ice rating of plus 5.